This holiday never gets old to me. I get the warm fuzzies just thinking about all the tradition. And as is tradition in my family, I am in charge of the appetizers. Since the caramelized onion dip I made for book club was devoured, I decided that would be my backup. I’ve learned to always have a backup. Plus, the Konters are big eaters who warrant two appetizers. 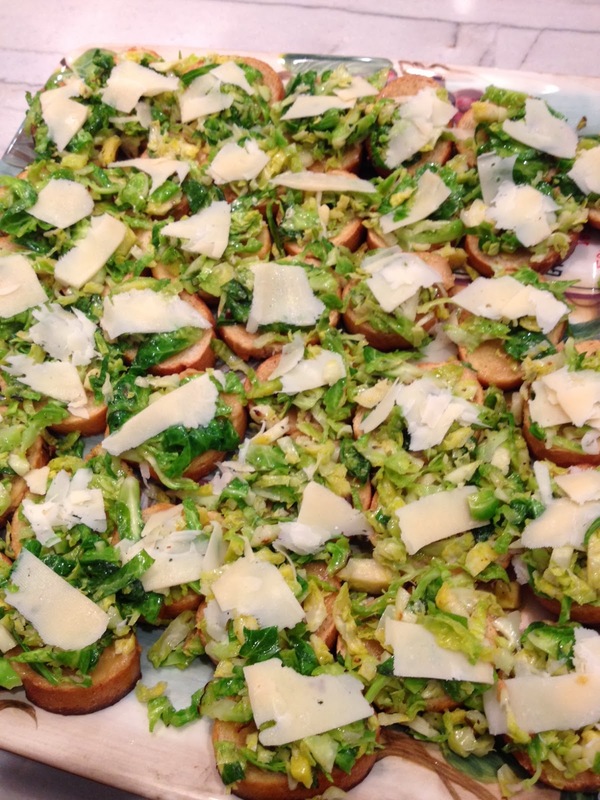 For my second appetizer, I made a Brussels sprouts and parmesan crostini. I used this recipe and it came out perfectly. Four heads of garlic may sound like a lot, but you’ll need every bit of it and it’s sweet once it’s all roasted. Yes, there’s parmesan in this but it’s not a ton and that doesn’t really count as a real cheese anyway so this is a great way to lighten up the regularly heavy, cheese-laden appetizer spread. It was also super easy to put together. The only thing that takes time is roasting the garlic, but that’s not anything that takes any effort – you just stick it in the oven and forget about it. I actually recommend doing it the night before so you really don’t have to worry about it. Once you’ve cut the sprouts into slaw, the whole thing takes about 15 minutes to cook and assemble. My father, who complained all day while I was cooking that he hates Brussels sprouts and I should have prepared something that he would eat, actually said this was “actually pretty good.” It may not sound like a rave review to you but considering his extreme detestation, it was a pretty high compliment. We had a smaller crowd for Thanksgiving this year, but we didn’t really know how to cook any less than we always do. In Konter fashion, we took that as a challenge to still go through just as much food with fewer people and this appetizer was no exception. Tags: Crostini, Holidays, Thanksgiving, Vegetarian. Bookmark the permalink.